In the latest version of PCSWMM 2009 (ver. 3.4), we have rolled out a compatibility mode for running earlier versions of the SWMM engine. In this version, we provide support for the last 2 years of EPA SWMM5 engine versions (i.e. 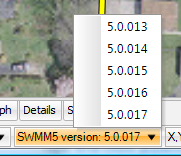 all versions from EPA SWMM 5.0.013 up to and including the latest version). By default, the latest version of SWMM5 is used, however switching the SWMM5 engine version is as easy as clicking on the pop-up list on the PCSWMM status bar. For some large, long-term SWMM modeling projects, consultants and/or their clients sometimes prefer the stability of staying with a particular version of the SWMM5 engine, and not automatically updating when a new version is released by the EPA. On the other hand, we (CHI) have a policy of always supporting and recommending the latest version of EPA SWMM5 (currently 5.0.017 - as of Oct 30, 2009) in our flagship PCSWMM software. Since we are rolling out an astounding number of exciting new features in PCSWMM every month or so, we wanted to provide a mechanism by which our users could download and benefit from the new capabilities without having to switch versions of the SWMM engine midway through a project. This also will allow users to be able to dust off older, completed project models and rerun them without having to recalibrate them, should the newer versions of EPA SWMM5 produce slightly different results. If you have a need for PCSWMM to support an even earlier version of SWMM5, please let us know.